This shirt is perfect for me. For those of you who don’t know, I’m missing the top third of the ring finger on my left hand. Of course, no-one ever notices, so I end up showing them and telling the the story about how I lost it. In the real world it happened in a pork pie factory rather than a noodle sweatshop, but it’s the missing finger that’s important, not how it was lost. Of course, this shirt isn’t just good if you’ve lost a finger yourself. Maybe you know someone who has, or maybe you just like eating human fingers. Whatever your reason, this cheeky little print is sure to brighten your day. “Noodle Surprise” is the first shirt I’ve bought from Split the Atom and I’ve got to say I’m impressed. I ordered it in the wee small hours of Sunday morning and by the time I got home from work on Tuesday it was there, sitting on my front mat waiting for me. They also made me smile by including a sticker in the package to go onto my laptop. Sure, it’s a little big to be able to go on in one go, but I can cut it up a bit and fit it in somewhere. It makes me happy when something a little extra arrives in the package with my shirt. 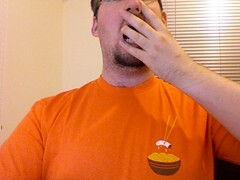 “Noodle Surprise” is printed on an orange American Apparel shirt, and is available from Split the Atom for £15.99. I like this t shirt, perfect for my mate, he has lost his little finger in an accident when he was younger, I think I might have to buy it for him.